A toy that educates … could it be a dream? I recently found something that fits that category, educating students in concepts of GEOMETRY. It’s called the Rubik’s Slide, created by Techno Source. I bought this Rubik’s Slide a few months ago because I needed another puzzle to keep my tutoring clients entertained while I grade their work, which I often do at the start of sessions. It’s your friend’s 73rd birthday. You’ve put together a surprise party and baked a special coconut meringue cake. But at the last minute you realize that — golly gee! — you forgot to get candles. Rummaging through your drawers with just five minutes before your friend’s scheduled arrival, you find that you do have 14 candles. 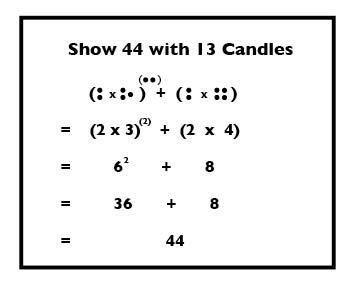 And being a brilliant mathematician, you realize that you can represent the number 73 with these 14 candles, using every candle. How do you do it? As a hint, here’s a model showing how to do a problem like this, if you are celebrating someone’s 44th birthday, when you have just 13 candles. Notice that each dot on the top row is one candle. Note that you may use icing to create the symbols: +, –, x, ÷, and you may also put in exponents, using candles to show the value of the exponent. 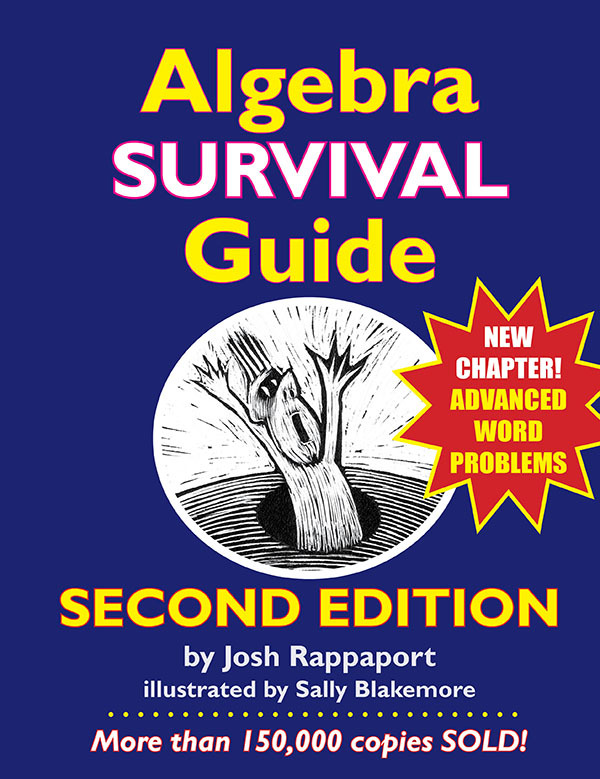 Please include your full name, where you live, and if you don’t mind, describe your connection to math and math education (for example: teacher, tutor, math enthusiast, etc.). The first person to send in a correct answer receives a $20 gift certificate toward the purchase of any Singing Turtle Press products. I’ll fill the winner in on the details by email.